What is Good Rehab in 2017? Where does Good Rehab start and who is responsible for Good Rehab? I am sure that these are questions many rehabilitation professionals have been pondering since time began. How do we know if Rehab is Good? We all know that Rehab and RTW – with the way it currently looks today, with how it so often operates in it’s own silo – isn’t working. We have so much evidence telling us that a truly integrated approach to recovery rehabilitation and rehabilitation is required. 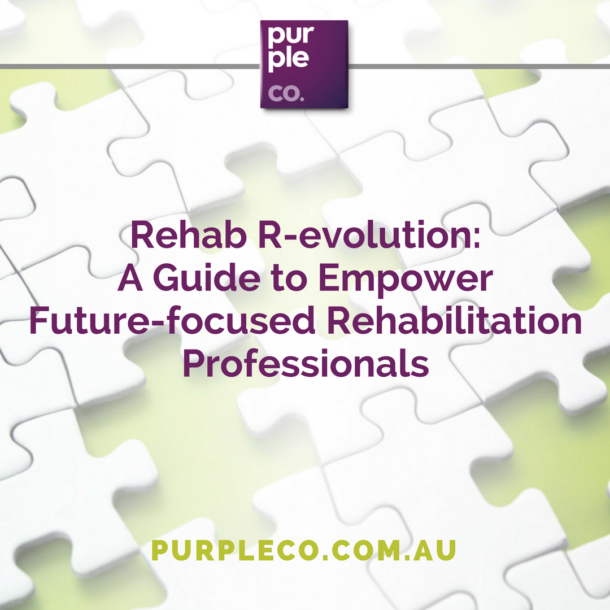 Where do we need to start as professionals in thinking about what is good rehabilitation? And more than just think about it, what needs to change for us to be able to execute good Rehab? To help us understand where I think we need to start, I have permission to share this email I received last week in response to the most recent Purple Co periodical that was sent out. “Just a personal message of thanks for your newsletter, and two most recent blog articles. I’m a Rehab Consultant, who is off work recovering from a nasty condition…. Whilst all the medical advice for my recovery has been focused on “time to heal”, no one thinks about telling you that the longer you are away from work, the harder it is to go back. Obviously it cannot be before you’re ready, but reading your articles this morning helped me realise (for myself and clients) it’s really important to keep in touch with the parts of your life that bring meaning. For me that’s helping others make the most of their lives. The truth of the matter is this – good Rehab starts with us! If we believe that good work is good for our health and live this truth then we will naturally do everything to help our clients get the most out of this truth. But if we think that work is hard, it’s not good, if we feel used, burn out, uncared for, lacking in certainty or a sense of contribution, then unfortunately this will come through in the way we go about our rehabilitation work too. It’s not enough to simply say “good work is good for our health”. We need to live this in the way we work, and do our work every single day. We all know that rehabilitation is a high-trust relationship between many stakeholders, our clients will always believe what we do much more than what we say they should do.. So, I ask you, are you working in a way that is good for your health? This is the topic I’m going to be exploring further on the RTW Summit coming to you in May. Mark has lined up an incredible group of speakers – a group I’m really proud and excited to be a part of. Jo Muirhead is a Rehabilitation Counsellor with over 20 years of experience in vocational rehabilitation. She owns two successful businesses and is the Founder, Director and Principal Consultant of Purple Co, a team of specialist consultants that help people manage their illness, disability or injury and reclaim their lives through work.